Y9 Design students completed a project this year which gave them the challenge of upcycling old shipping pallets into new, usable products. From Monday 13th June until Wednesday 15th June, a selection of these will be on display in the CAB atrium. The items will be available for sale to raise money for a NIST service partner, Second Chance Bangkok (www.scbkk.org/about-us.html). 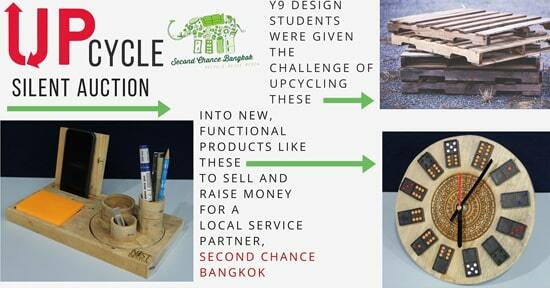 SCBKK are a local initiative by residents of Bangkok’s largest slum, Klong Toey, who also use upcycling principles. Step 5: Hope that no one outbids you, keep checking back! Step 6: Auction will close at 2:30pm Wednesday 15th June when you will be contacted to let you know you have won! In addition to this on Monday 13th June only the SCBKK shop, who employ local residents with sewing skills to make beautiful thai crafts will also be selling their products. These items will be great gifts for friends and family over the holidays and any money spent will go to a good cause.